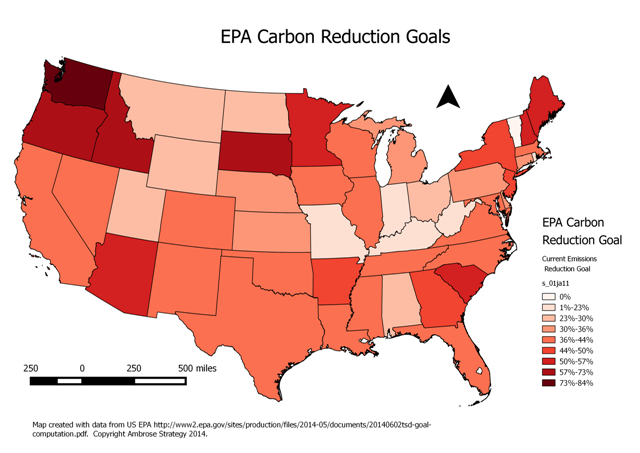 The EPA used four factors in determining each state’s carbon reduction goal. electricity generation (aka states that are more dependent on coal). It’s worthwhile to take a look at a map of the reduction goals. The map shows the percentage reduction in carbon emissions that each state is required to make by 2030. The southern states, which tend to be more reliant on coal, generally have higher goals – ones that are in the top half in terms of percentage. South Carolina has one of the higher goals in the nation at 57%, due in part to the fact that two new nuclear reactors have been licensed there. It’s also worthy of note that West Virginia, although it has the most carbon intensive electricity production of any state in the nation, has among the lowest carbon reduction goals in the country. Nationally, the highest energy reduction goals are generally in the Pacific Northwest and New England. Interestingly enough, Vermont doesn't have a goal, because it doesn't have any fossil fueled electric plants.